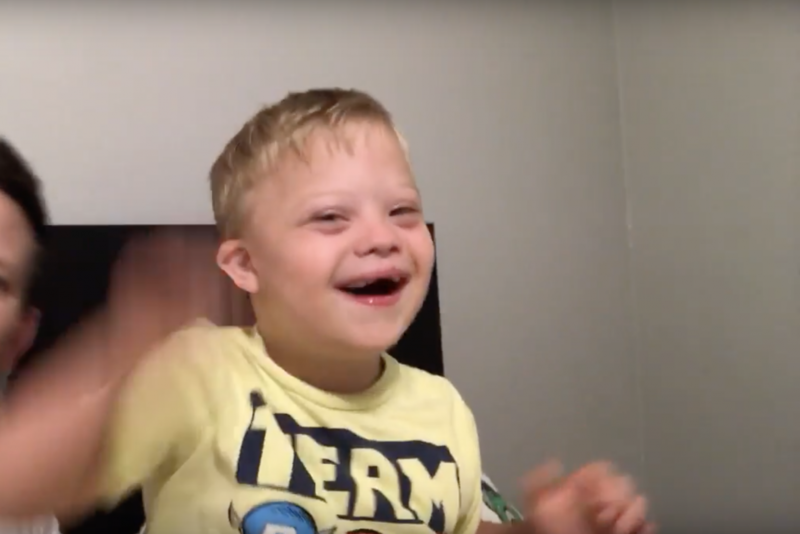 You are here: Home / Family / I Love Hearing Noah Sing the Mickey Mouse Clubhouse Theme Song! I love hearing Noah talk and sing! As Noah has gotten older, it’s been a lot of fun hearing his speech develop. We’re big fans of sign language in our household (in fact, it’s how Noah said his first sentence) but it’s also been fun hearing Noah move from sign language to speaking verbally. As you can hear in the video below, his speech (and singing!) is really coming along nicely. In case you’re wondering, Noah currently receives speech therapy at the public school he attends, as well as private speech therapy once per week. In addition to speech therapy, I think being around typical children for most of the day, and being able to hear them talk, as well as having a typical brother (and dad!) that likes to talk…a lot…helps Noah learn to talk himself. Noah does a pretty good job of mimicking the behavior of others. Noah is also a fan of music, and enjoys singing along to songs (I can’t how many times I’ve heard songs from the Frozen soundtrack!) I think hearing songs he enjoys, helps him memorize the words. I don’t know about your children, but our children are big fans of the Mickey Mouse Club House, and as you can hear in the video above…Noah loves singing their theme song! I wish Noah had more words, and could speak more clearly. I would love to sit and have conversations with him like I can do with our three year old. But I can’t. I would love to understand more of what he’s trying to say to us. But I can’t. It’s all good though. What I can do is celebrate each word he says, and not compare him to anyone. Noah is his own, unique person. He’ll be everything God created him to me. Nothing more. Nothing less. He’ll hit milestones, and grow on God’s timetable, not mine. And that’s ok. I’m so proud of all of the milestones he has already hit, and for how hard he works at everything. He is such a fantastic boy, and it’s a blessing to be his daddy! How is your child doing in regards to speech? Do you ever discouraged at his / her lack of progress? What do you do to help your child with their verbal skills? Leave a comment below and let us know! Our daughter will be 5 in May. She has DS and does not speak. She “moans” and fussed when she needs something. We wonder if speech will ever developed. She gets speech therapy at school and I am not sure if signing would be doable with her as her motor skills are very behind. Hi Christy, thanks for your comment. I know that can be disappointing, but let me encourage you to keep at it. Just keep loving and supporting her! I feel the same way Noah’s Dad! And we are ASL users as well, I think it has given my daughter immense confidence to use ASL AND has greatly contributed to her large vocabulary despite not being able to speak clearly. That will come. My son Wayne had a speech because of his palet, but eventually his speech. Improved enough so everyone coul understand him. Have patience and encourage her.